Yesterday in my post about sustainable accessibility, I included a link to this lecture by Dr. John Sterman. The lecture, part of MIT’s series of seminars about transportation, provides a great introduction to the concept of accessibility as an alternative way to consider transportation system design. To design a sustainable and successful accessibility system, Sterman says, we need research across areas, including technical innovation; policy and business practices (i.e. new business models, policies, economic issues, price externalities that are currently not priced at all); and human behavior (i.e. taking full account of idiosyncrasies and irrational aspects of human behavior). All of this must be integrated. I’ve outlined Sterman’s points below, and if you get a chance, watch the full video. The world’s population in February 2010 was 6.8 billion people, and it is growing by 77 million each year. At this rate, world population will reach at least 9 billion by 2050. And most of this growth is taking place in developing countries. Today, most people in developing countries don’t have access to personal transportation, and more than 1 billion people have no access to motorized transportation. But they’re getting richer. Transportation uses two-thirds of all the world’s petroleum and accounts for a bigger and bigger share of the world’s total carbon emissions. Simulations from Climate Interactive show global CO2 emissions rising to 140 gigatonnes of CO2 equivalent per year by 2050 at the current rate. This needs to be cut substantially to have any chance of staying below the established “dangerous climate change” mark of 2-degree Celsius increase from pre-industrial temperature levels, established as a goal at 2009’s Copenhagen Accord. We’re already 0.8 degrees Celsius above pre-industrial levels today. Even attempting to achieve the 2-degree target, then, will require massive changes in transportation infrastructure. In case you aren’t convinced by the global warming argument, Sterman reminds us that reducing America’s dependence on oil is a national imperative: in the United States, oil production peaked in 1970, and Americans now import two-thirds of the oil they consume, which means borrowing US$1 billion per day for oil. Oil dependence also implies vulnerability to supply disruptions, geopolitical instability, and terrorism. And ground level air pollution costs Americans approximately $120 billion per year and is responsible for 20,000 premature deaths per year in the United States. Imagine if the world’s 9 billion people in 2050 get around the way Americans do now. This would mean 7.6 billion motor vehicles on the road, consuming 440 million barrels of oil per day. Total world production today is 82 million barrels per day; so whether you believe we’ve already reached peak oil, or we’ll reach it in the next ten years, there’s no way our current model is sustainable. Efficiency improvements and technological improvements are absolutely necessary, but not sufficient. We need to switch focus to what people want, using end use/least cost planning. In transportation, people don’t want transportation in itself, but rather access – access to goods, services, people and opportunities with whom we want to engage. We need to find the most efficient way to provide access to all. The goal of transportation planning should be to design and implement sustainable accessibility to the goods, services, people and opportunities needed to promote human welfare while preserving and restoring the environment. The focus should be on sustainable accessibility, rather than sustainable transportation. In designing a new transportation system focused on accessibility, we will be dealing with a complex, dynamic system, which incorporates many factors: mobility, energy, environment, safety, health, technology, information, infrastructure, economics, settlement patterns, urbanization, social structure, globalization, personal and political behavior. Remember that with complex, dynamic systems, it’s very hard to find high leverage points for sustainable improvements. Policies are easily defeated by the “policy resistance” phenomenon. Complex systems are also interactive, self-organizing, and self-creating. Planning will need to integrate all of the areas mentioned above. More roads means more traffic. Photo by Atwater Village Newbie. In U.S. metropolitan areas, individuals on average waste a week each year stuck in traffic during commutes. Nonetheless, in the United States, we are approaching 3 trillion annual VMT (vehicle miles traveled), and 75.5% of people who commute to work do so driving alone in car. These numbers are not really changing in spite of an enormous economic recession, and before that, very high oil prices. The traditional approach – the conventional mental model – is flawed: Travel time depends on how much traffic volume there is relative to the capacity of the highway. 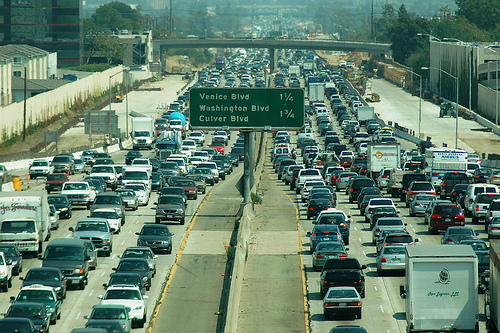 As travel time increases, so does political pressure to reduce congestion. In response, people build more roads to ease the capacity problem – but congestion doesn’t go away! More people give up their metro passes and start to drive. This increases the number of cars on the roads, boosting travel time. And all of this happens quickly. This can completely offset – and more – improvements in highway capacity. (See how this already happened with Big Dig in Boston). So as travel time goes up, there is more political pressure to reduce congestion, so people build more roads, increase highway capacity, make more areas accessible, and traffic goes up more. Feedback effects don’t control travel time – they control the size of the metro area: You get sprawl. So why don’t people use other options? Because of limits on public transit. As travel time goes down, the attractiveness of driving goes up, which lowers the revenue of your local public transit system, creating a large deficit. Public transit systems need to cut the size of the network (abandon routes or cut quality of service), which makes driving even more attractive, or raise fares, which makes driving even more attractive. So increasing road capacity does not control congestion or travel time. Travel time is not a controllable variable using the policy instrument of highway capacity – this only controls how many forests are cut down and farms paved over. Much effort has been put into intelligent vehicle highway systems (IVHS) technology: getting real-time traffic reports and optimal routes using data from sensors embedded in highways which will be used for pricing on Virginia’s new HOT lanes, autonomous vehicles, etc. This also doesn’t do any good, because any positive impact from this technology is also immediately compensated for. Technology must be coupled with social, economic, and political solutions – we need to increase the cost of driving. Ways to raise the cost of driving include time of day pricing; tolls, fuel taxes or mileage taxes; and pricing carbon to cover many of the externalities from burning fossil fuels. This reduces the attractiveness of driving without increasing travel times. There have been successful experiments with such policies, including London’s congestion pricing. But revenues must be used to boost public transit options or for research and development for alternative energy. This makes sense economically because public transit is a collective good subject to market failure. There is definitely market failure, and the government needs to correct it. 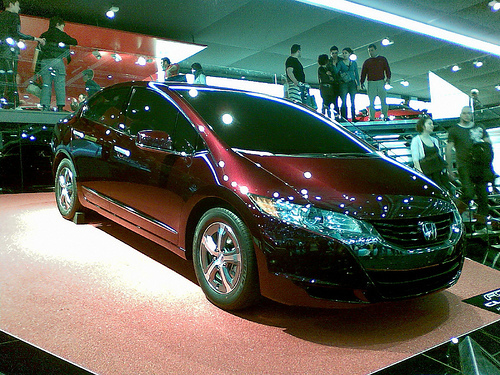 Honda FCX Clarity hydrogen-powered fuel cell vehicle. Photo by alyore. Clearly there is a vital need to transition away from internal combustion engines (ICE). Three countries have tried to deploy alternative fuel vehicles: Brazil (first try in 1979), New Zealand, and Argentina. There has been a wide range of policies in these countries to stimulate the adoption of AFVs: tax exemptions for alcohol-powered vehicles; making alcohol cheaper; contracts with automakers to provide vehicles that could run on ethanol; mandatory fuel stations. Intrinsic problem: nobody will buy until there’s a fueling infrastructure and they can get fuel anytime, anywhere – but nobody will spend billions to create this infrastructure unless they’re sure there’s going to be a market. Simulations: Using progressive southern California as a test, simulations show that market for Hydrogen Fuel Cell Vehicles (HFCVs) grows if these vehicles are heavily and aggressively subsidized, but collapses as soon as subsidies end. So we need to change our approach.